Simple satin green clutch bag by Menbur, Spain. Small self-coloured rope handle enclosed and magnetic catch fastening. Width 25cm height 12cm. 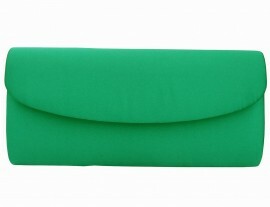 The clutch bag comes in a selection of other colours.